Congratulations are in order—you have called in the professional realtor at Schreiner Realty and together, you have found new dream home! Your “old” home is listed and ready to sell, but while you wait for future showings and potential buyers, there are a few easy and inexpensive ways you can increase the saleability of your home. When it comes to selling property, first impressions are everything. From the second buyers step onto the curb in front of your house, they are starting to form an opinion about the property and whether they can see themselves turning the house into a home. Things that are seemingly simple like maintaining a tidy and manicured yard will instantly boost your house’s curb appeal, catching the attention of potential buyers and inviting them to take a closer look. At Schreiner Realty, we want to make your real estate dreams a reality—whether you are dreaming about selling your current property or dreaming about finding the absolute perfect new home, we can help! 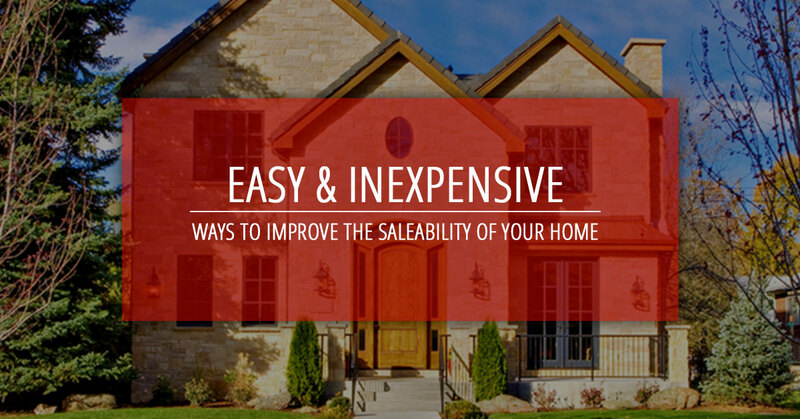 Check out our list, below, of easy and inexpensive ways you can increase the saleability of your home! These simple tasks that require minimal effort will beautify your house’s interior and exterior, making your house stand out from other homes for sale in the area! Give the front of your home a facelift. Allotting some time to manicure your front yard is another step you will want to take when beautifying your home’s exterior. A house with green, freshly cut grass and beautiful vibrant plants is going to have much more curb appeal than a house with patchy, brown grass and lifeless vegetation. If your yard is already in decent shape, you will likely only need to designate an hour or two to making ultra easy modifications like mowing the lawn, raking leaves or even planting a few flowers. After you’re done, step out onto the curb and ask yourself if your house looks like an inviting, attractive, future home for buyers. A little yard work goes a long way and is such a simple step you can take to dramatically boost the curb appeal of your home. If you are looking for creative ways to beautify your yard, check out this helpful article from Better Homes & Gardens. Tuck away knick knacks to create clean, uncluttered spaces. When potential buyers attend a showing of a home for sale, they walk through the house envisioning what it would look like if their family lived there. When shelves and tables are cluttered with family photos, soccer trophies and other miscellaneous knick knacks, the buyer is going to have a hard time picturing their family in the space. Pack away all of the items and photos that make your home look crowded and cluttered and stick with displaying only a few family photos—this will give the house a warm, family-oriented vibe, which will be attractive to buyers with kiddos. If you feel like your space is looking too empty after you have packed your knick knacks away, adorn shelves with artificial flowers or other understated, decorative home decor. Less is more. Consider hiring a professional cleaning crew. Unless you are ready to reach high and bend low to clean every nook and cranny, spending a little money hiring a professional cleaning crew is a great idea. A professional crew will be able to quickly and efficiently deep clean your home, focusing on everything from cobweb-laden corners to dusty ceiling fans. Professional house cleaners also know the right products and tools to use when cleaning things like expensive furniture. They will conquer the cleaning job in half the time it would take you to complete the same job—we’re not doubting your housekeeping skills, we just know how beneficial it can be to team up with expert cleaners! If paying for professional services is out of your budget, round up the family and get your clean on! Peek at this helpful article from Care.com that outlines 17 cleaning secrets from professional housekeepers. The article offers helpful tips and suggestions such as using a yardstick with a sock pulled over one end to reach high-up dust and cobwebs. Of course not every buyer is going to be swiping countertops with a white glove and inspecting baseboards for crumbs, so “missing a spot” isn’t extremely detrimental, but whatever you do, do not forget to clean your windows, both inside and out! Sticky hand-printed windows with a filmy haze on them are not appealing to anyone—especially a potential buyer for the home. Pack away clothes and other belongings to show off how spacious rooms and closets are. In a previous blog, we mentioned the importance of starting to pack at least a month before you move to help eliminate stress. When it comes to freeing up closet, cabinet or bedroom space, this is the perfect opportunity for you to start packing. When potential buyers tour a house, they want to be able to see how much space they are going to have to work with. If closets are stuffed full of coats, shoes and stacks of shirts, they will hardly be able to tell just how roomy the closet actually is. The same goes for bedrooms, bathrooms and the garage. Make each room look as spacious as possible to really show buyers the beautiful space they’re looking for. Your home is lovely and you should be proud to show it off! Spend a little extra time focusing on flooring and carpets. When you are in your home everyday, it is easy to overlook just how dirty your carpets get. When you begin to move furniture and pack up smaller pieces, though, you will notice how “lived in” your carpets and floors look. If hiring a professional crew to clean your carpets and buff your floors is out of your budget, all you need is a carpet shampooer and walnut to take care of minor stains and scratches on your own. If you have hardwood floors and notice minor scrapes and scuffs, simply rub these areas with a walnut to fill the cracks—make sure you first double check your flooring’s finish and test the walnut on a small corner of the hardwood before you start to fill in bigger, more prominent imperfections. Shampooing every inch of your carpets, on your own, will be a very time consuming task. If you’re up for the challenge, good for you! If, however, you don’t want to devote that much time to cleaning carpets, focus your efforts on larger, more noticeable stains and spills. You will be amazed with how new and clean your carpets look. Get in touch with Schreiner Realty. For all of your real estate needs, call the professional realtors at Schreiner Realty. We are here for you throughout the entire buying/selling process—from start to finish. If you live in Chandler, Gilbert, Mesa or Tempe and are looking to buy or sell you home, we are your premier provider of the most professional and thorough real estate services. You and your family are our priority and we will do everything in our power to help make your real estate dreams a reality. Get in touch with us today. We know there are many other realtors you can turn to when you are ready to buy or sell a home, which is why we appreciate your business and look forward to teaming up with you soon!